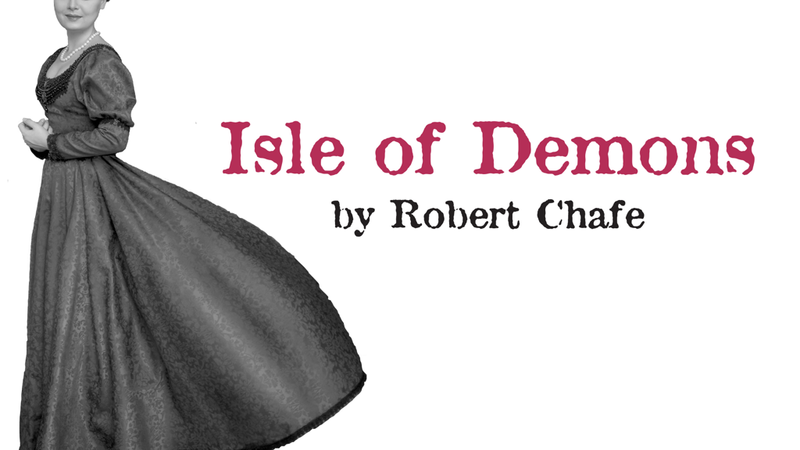 Isle of Demons was originally commissioned by Theatre Newfoundland Labrador and premiered at their Gros Morne Theatre Festival in 2004. It is performed by arrangement with Ian Arnold, Catalyst TCM Inc.
Emily Austin is a scenic painter and carpenter based in St. John’s. She holds a BFA in Technical Theatre from Grenfell Campus, Memorial University. She has helped build and paint sets for almost every theatre company in St. John’s over the past year and a half. She’s been working for PerSIStence since their beginning and is thrilled to see the rocks (and the lovely cast members) return to the stage in Isle of Demons. Robert has worked in theatre, dance, opera, radio, fiction and film. His stage plays have been seen in Canada, the United Kingdom, Australia and in the United States, and include Oil and Water, Tempting Providence, Afterimage, Under Wraps, and The Colony of Unrequited Dreams (adapted from the novel by Wayne Johnston.) He has been shortlisted twice for the Governor General’s Literary Award for Drama, and he won the award in 2010. 2016 saw the premiere of his first opera, Ours (with composer John Estacio), and the release of his first book of fiction Two-Man Tent (Breakwater Books). He is the playwright and artistic director of Artistic Fraud of Newfoundland. Rachel is thrilled to be joining Persistence Theatre for their remount of Isle of Demons. She is a graduate of the Diploma in Performance and Communications Media from Memorial University. She has been involved in theatre in multiple capacities with companies such as Beothuck Street Players, Peter MacDonald Productions and most recently as stage manager for The Taming of the Shrew at Perchance Theatre. She has also been working in film, mainly on the assistant director’s teams, for productions including Republic of Doyle and season three of Frontier. Marie is an AB-born performer, writer and director based in St. John’s since 2012. Some of her recent appearances include Women Playing Hamlet (Persistence Theatre), West Moon, Trinity Pageant, No Man’s Land (Rising Tide Theatre), Room for a Pony, Curved (Women’s Work Festival), Proud, Village Wooing (Double Sure Theatre Co-op) and Under Wraps (Artistic Fraud). Marie holds a BA (Hons.) in Drama from the UofA and is a grad of George Brown Theatre School. She’ll be back to the Hall May 7 with Darren Ivany’s Cookstown and will revive Berni Stapleton’s Woman in a Monkey Cage in late 2018. Allison is an actor from Gander. She holds a Bachelor of Fine Arts from Grenfell Campus and a Masters of Fine Arts from York University. She has performed with companies across the province such as Rising Tide, Perchance Theatre, Gros Morne Theatre Festival, Resource Centre for the Arts Theatre, and c2c. Film credits include CBC’s Little Dog and Republic Of Doyle, G. Patrick Condon’s Incredible Violence, and Riverhead. Allison has recently spent the winter teaching acting at Grenfell campus. Evan is delighted to get the chance to return to the Isle of Demons. An actor from Shearstown, NL, Evan has been fortunate to have worked with many great theatre companies in the province such as Poverty Cove Theatre, Perchance Theatre, Rising Tide, and TNL, among others. Recently he appeared on his debut feature film Riverhead for which he was nominated for a Canadian Screen Award in the category of best actor in a supporting role. Evan also appeared as Spam on the recent CBC dark comedy Little Dog. Enjoy the skit! A graduate of the CNA Textile Studies Program at the Anna Templeton Centre in St. John's, Melanie has worked on several productions with such theatre companies as White Rooster Theatre, Theatre St. John’s and PerSIStence. In addition to costume design, Melanie is also working on a collection of tales based on life in a vibrant little city on the edge of the world. After much adventure and some living away, for the moment she lives in her native St. John's with her family. She is delighted to be back with Isle of Demons. Alix is a director from St. John’s currently residing in Edmonton, AB. A recent graduate of the University of Victoria’s MFA Theatre Directing program, Alix is thrilled to be home to work with PerSIStence Theatre. Upcoming shows include: Shakespeare by the Sea's Shake it Up in St. John's (2018) and the Walterdale Theatre's Leave of Absence in Edmonton (2019). After stage managing the inaugural production of Isle of Demons with PerSIStence in 2017, Alix has been inspired by this dedicated team throughout the process of pushing the show a step further. She would like to thank the actors and crew for being so receptive to her leadership and engaged in the process. George has worked as an actor, musician, and sound designer (often simultaneously in two or three of these capacities) with many theatre companies in Newfoundland and Labrador, including Perchance Theatre, RCA Theatre Company, c2c theatre, Rising Tide Theatre Company, New Curtain Theatre, Open Theatre Company, Kanutu Theatre, Poverty Cove Theatre Company, Shakespeare by the Sea, Beothuck Street Players, Nothing On Productions, and others, as well as appearing in several locally produced film and television projects. He is thrilled to be re-joining a superb cast and crew for this new presentation of PerSIStence Theatre’s inaugural production.